Lakeside Crossing at Eagle Creek offers an inviting retreat from the stress of everyday living. 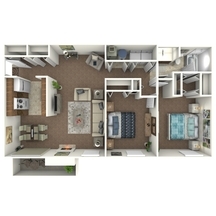 With comfortable, spacious apartments and town homes in 1, 2, and 3 bedroom floor plans, you're sure to find the perfect fit for your household. 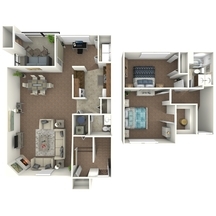 Many of our apartments offer stylish upgrades and finishes. Relax and recharge in our 24-hour fitness center, shimmering swimming pool, on our lighted tennis courts, or with your pet at our bark park. 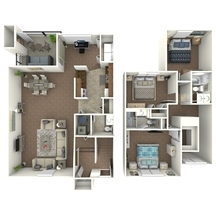 You'll find the perfect home for your lifestyle at Lakeside Crossing at Eagle Creek. Restrictions or other terms: Lakeside Crossing at Eagle Creek is a pet-friendly community and we have a Bark Park perfect for your pets! A one-time, non-refundable pet fee of $250 per pet is required. $25 monthly pet rent per pet is also required. Two pets maximum per apartment home. Breed restrictions apply. Please call our leasing office for our complete pet policy. We offer plentiful surface parking for our residents, as well as carport spaces available for $20 monthly.